Tuberculosis remains one of the leading causes of death with an estimated 9 million new cases every year. In 2011, 1.4 million people died from TB, including almost one million deaths among HIV-negative individuals and 430 000 among people who were HIV-positive. TB is one of the top killers of women, with 300 000 deaths among HIV-negative women and 200 000 deaths among HIV-positive women in 2011. There have been remarkable achievements in the past decade. The MDG target for halting the incidence of TB is on track and prevalence and mortality are falling slowly. Over 10 million lives will be lost to this preventable, curable disease; over 4 million of them will be women. Millions of children will be orphaned needlessly. Experience throughout the world has proved that where TB patients, activists and communities are actively involved in TB prevention and care efforts, research, crucial issues of new case detection, community health services, regulatory affairs and provision of timely services, are addressed effectively. However, unlike the HIV/AIDS community, the engagement of TB affected community is very limited at the global, regional and national levels. 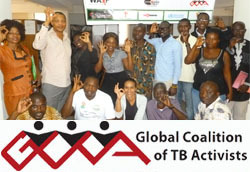 To bridge this gap, as well as to ensure continuity from the Community Task Force and to evolve to the next level based on the current realities, needs and challenges, the Global Coalition of TB Activists (GCTA) was created.